If you’re looking live a healthier life, the first step is to know exactly what you’re putting into your body. Estimating your fat and calorie intake is a good start, but why guess when you have the facts right in front of you? 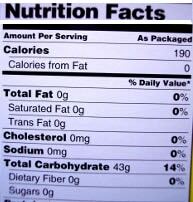 Nutrition labels are important sources of information that can help you on your way to a healthier you. We’ll tell you exactly how to read them and what you should be looking for. Serving sizes can trick you into thinking that foods are healthier than they actually are. A glance at a nutrition label could trick you into thinking that a small bag of chips contains 10 grams of fat. The truth may be that there are actually 10 grams per serving and 3 servings per bag. The serving size can also serve as a rough guide for how much a person should eat in one sitting. If there are two servings in a box of macaroni and cheese, for example, then you probably should not be eating the whole box for dinner. The average person should eat around 2,000 calories per day. If you’re trying to lose weight, the goal is to burn off more calories than you consume, so try to stick to low-calorie foods. If a food contains over 400 calories per serving, it is safe to consider that food high in calories. Fat, cholesterol, and sodium, should all be limited as much as you can. Fat is often broken down into saturated fats and trans fats, both of which are dangerous to your health. Keep in mind that some fats are good for you, but staying away from trans fats and saturated fats as much as possible is a must. Fiber is what keeps your digestive system going, and it’s incredibly important to your health. Aim to pick foods that have over 5% of your daily fiber in them. Whole grain pasta, fruits, and vegetables will get you well on your way. The average person should consume between 20 and 35 grams of fiber per day. Protein is an important part of every person’s diet. Click here to find out how much protein you need per day. Look at the “% daily value” column. You want to make sure you’re getting 100% of each nutrient every day, so foods rich in vitamins and minerals should be favored. You can also look into taking a multivitamin supplement if you don’t think you’re getting all the nutrients you need each day. Also, don’t forget to read the list of ingredients to see what is in your food. The ingredients are listed with the most abundant ingredients first. This means that if your food lists wheat flour as its first ingredient, then it consists primarily of wheat flour. The ingredients at the end of the list make up the smallest parts of your food product. Try to avoid the following ingredients:hydrogenated oils, high fructose corn syrup, enriched flour, artificial coloring, artificial flavorings, artificial sweeteners, and monosodium glutamate (MSG). It is difficult to cut all of these ingredients out of your diet, but do your best to stick to foods whose ingredients you recognize, and you’ll be off to a good start. This column was contributed by Allison Evans of Fit & Fab Living.